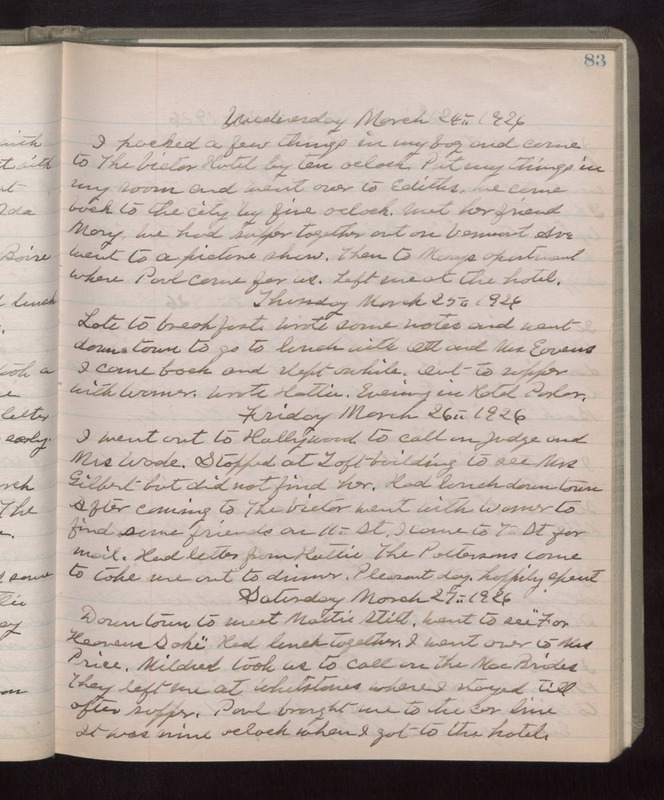 Wednesday March 24th 1926 I packed a few things in my bag and came to The Victor Hotel by ten oclock. Put my things in my room and went over to Ediths. We came back to the city by five oclock. Met her friend Mary. We had supper together out on Vermont Ave. Went to a picture show. Then to Marys apartment where Paul came for us. Left me at the hotel. Thursday March 25th 1926 Late to breakfast. Wrote some notes and went down town to go to lunch with Ott and Mrs Eavens. I came back and slept awhile. Out to supper with Warner. Wrote Hattie. Evening in Hotel Parlor. Friday March 26th 1926 I went out to Hollywood to call on Judge and Mrs Wade. Stopped at Taft building to see Mrs Gilbert but did not find her. Had lunch down town. After coming to The Victor went with Warner to find some friends on 11th St. I came to 7th St for mail. Had letter from Hattie. The Pattersons came to take me out to dinner. Pleasant day, happily spent. Saturday March 27th 1926 Down town to meet Mattie Stitt. Went to see "For Heavens Sake." Had lunch together. I went over to Mrs Price. Mildred took us to call on The MacBrides. They left me at Whetstones where I stayed till after supper. Paul brought me to the car line. It was nine oclock when I got to the hotel.